RSEvents! Pro takes a step further and comes with built-in solutions for every event related aspect: visibility, social sharing, emailing, registration and of course, payment. RSEvents! Pro can be customized to show the information you need to see on the dashboard. You can add the modules that you're interested in and remove the ones that you won't need. 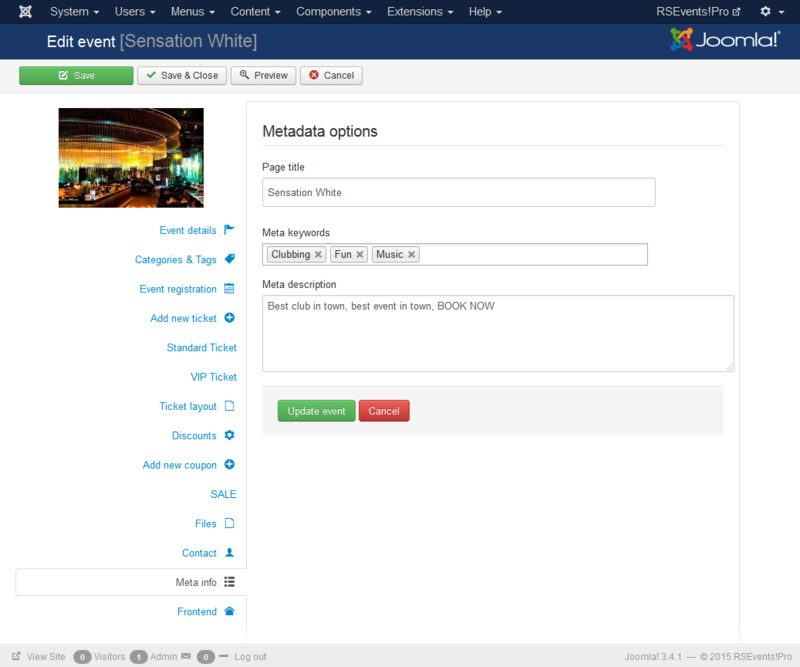 Within the administrator interface you can enable, disable or add new elements, so that you have a complete picture of what is going on within your event management system. 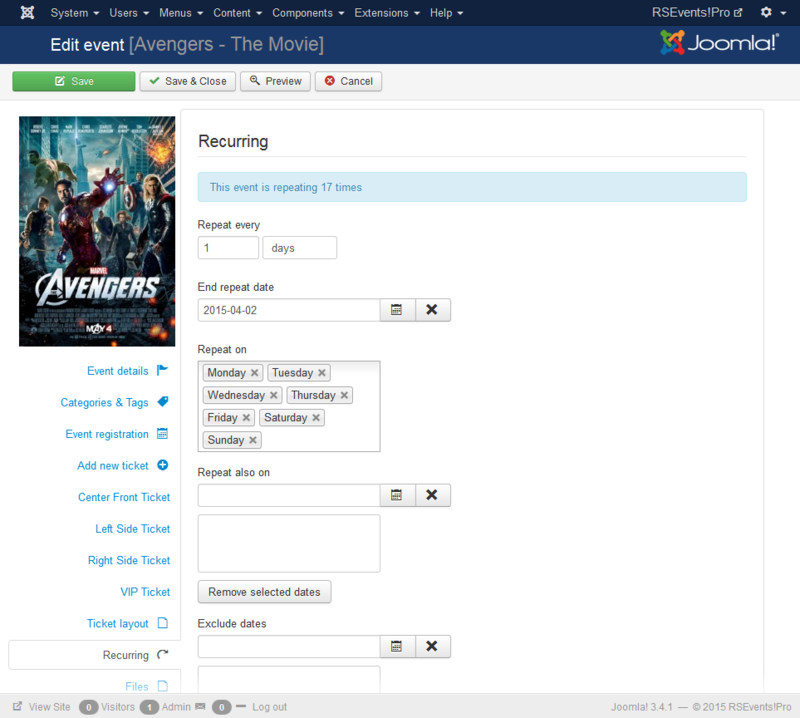 Having this into consideration, the rsjoomla.com team developed an active Dashboard for RSEvents! Pro. 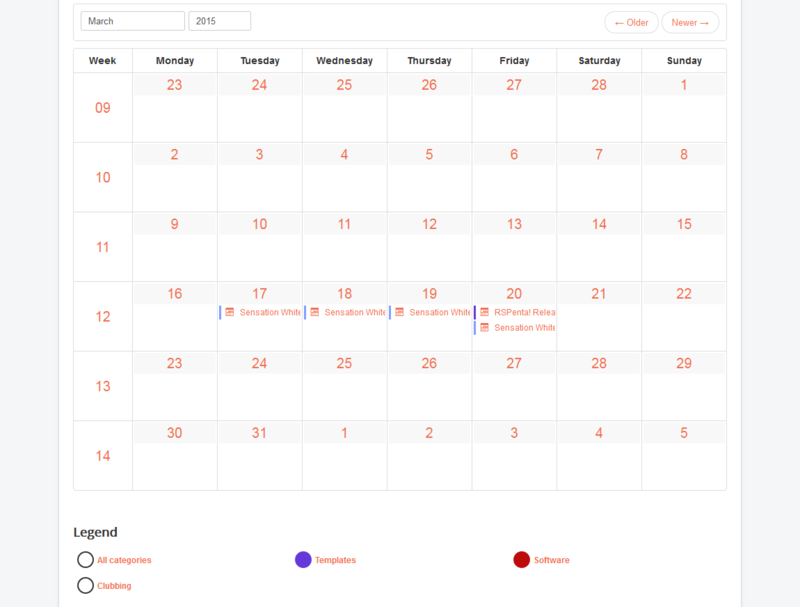 Here you can see the latest subscriptions, upcoming events, update status and of course, one button synchronizations with Google or Facebook events. 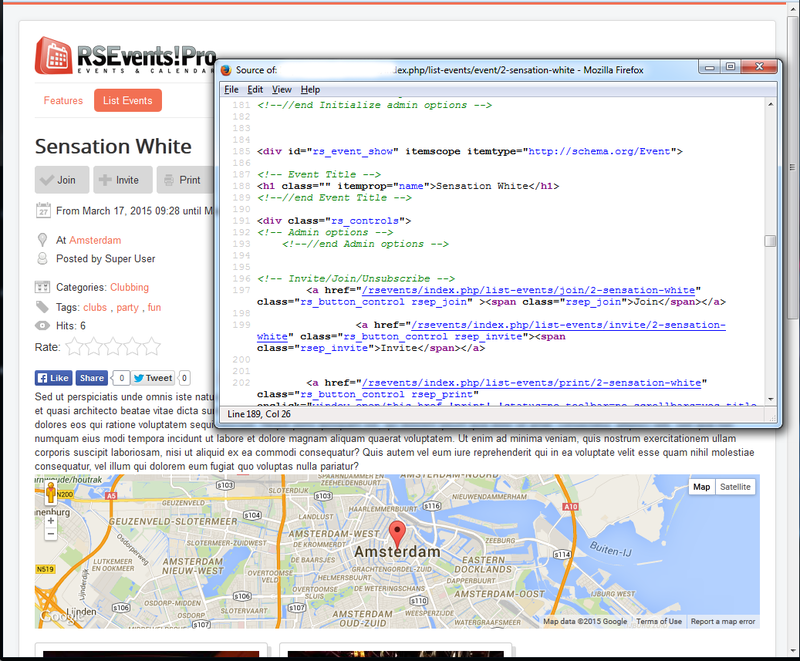 RSEvents!Pro can be customized to show the information you need to see on the dashboard. You can add modules such as New subscribers and Upcoming events in order to get the information that you need faster and more efficiently. 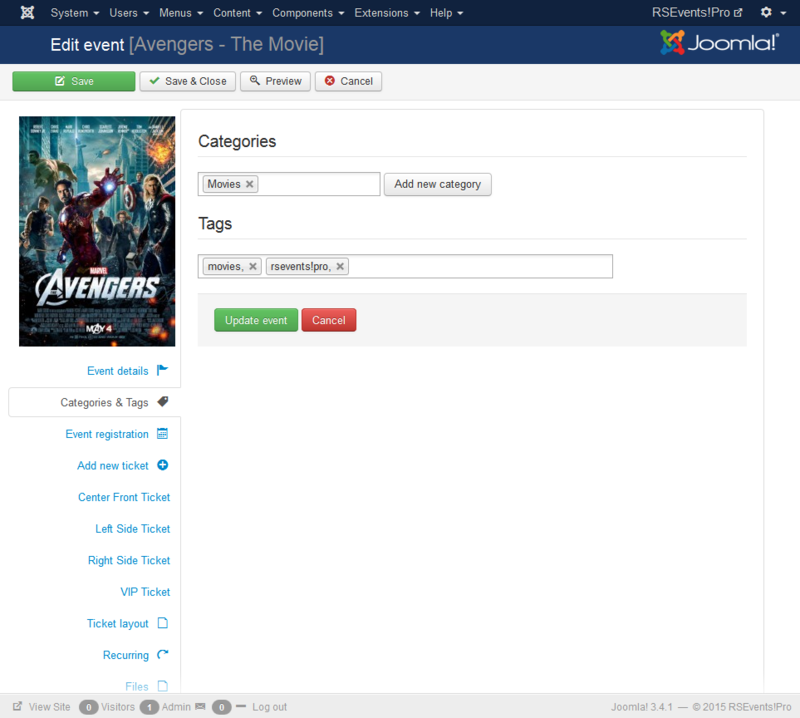 The new AJAX event editing interface maximizes the usability by letting you creating categories and locations while editing the event. You can also leave the event incomplete and return editing it later. We tried to simplify the looks so we grouped fields into specific blocks that will be easier to identify and edit. The event registration and recurring will only show up if you need them. We have thought of all the possible ways that you could repeat an event and put them all together, in order to let you create recurring events the way you need it. You can repeat events daily, weekly, monthly, yearly, in some specific days of the week only, once every 2,3 weeks and so on. You'll see exactly how many instances will be created while changing the repetition rules. Also you'll be able to add changes to the whole series of events or only to one of them. 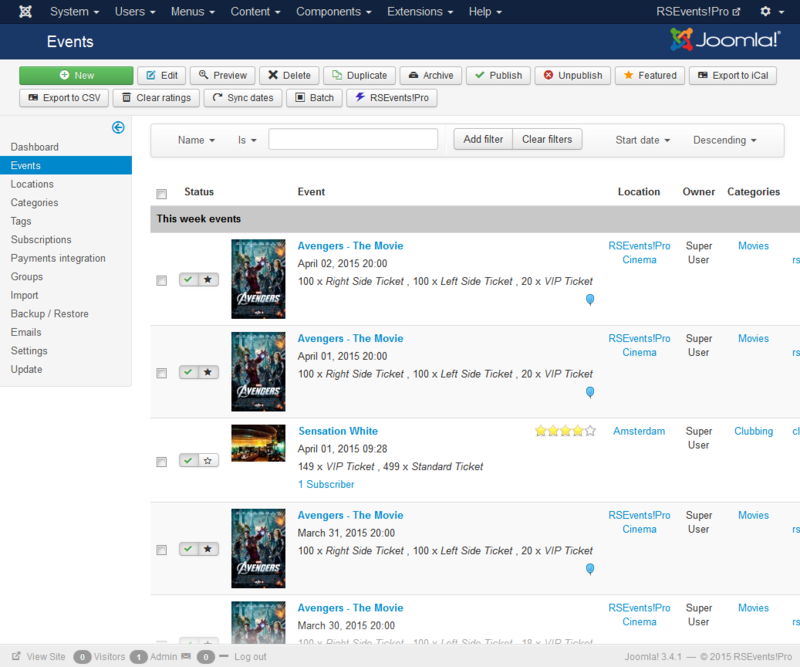 The events can now be labeled with tags in order to easily identify them and create listings. Categories have color codes that can show up in the calendar view and you can create unlimited levels parents to better organize your events. Being able to tag events combined with the nested categorization lets your users find the events more easily. Color coding is also preatty useful tool. It allows you to mark events accordingly. This can be used within the event calendar view. When creating a menu item that lists events, you can combine multiple parameters, such as tags, categories, locations and so on. 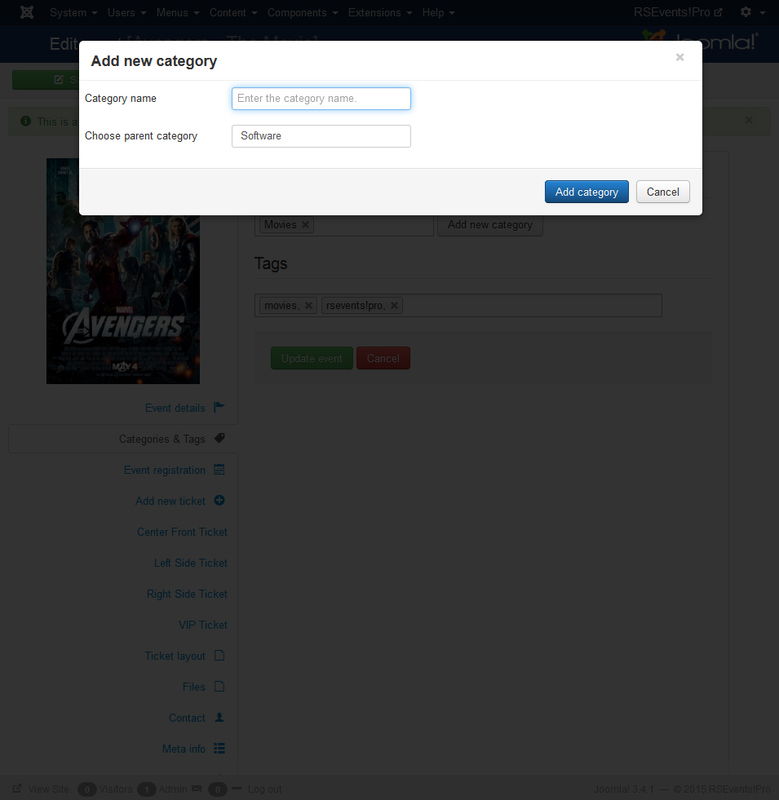 This feature allows you to create personalized listings of events that are in some of the categories and happen in a certain location with certain tags attached. 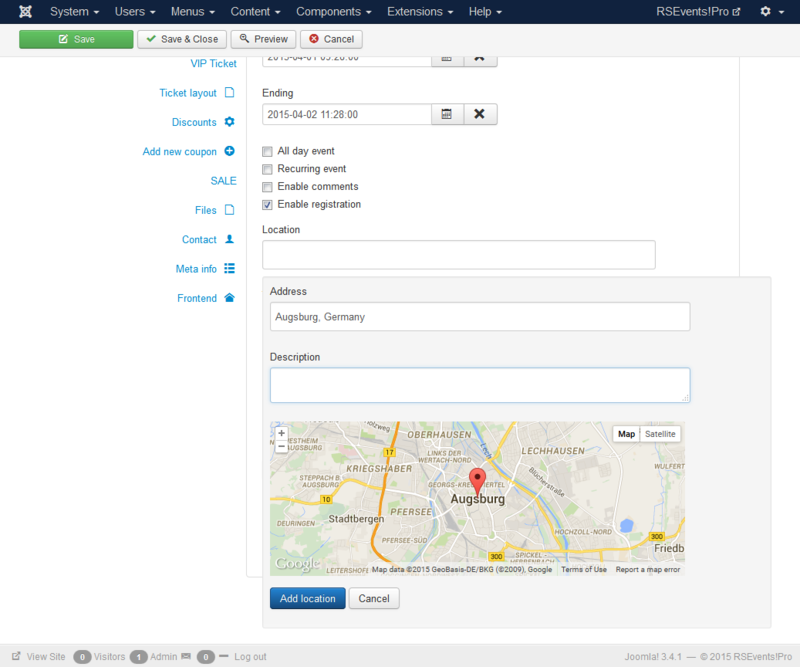 You can also set the default ordering type and direction, and choose the event period and enable the search bar. With RSEvents! Pro you can sell entrance tickets to your events and also set limitation and overbooking on the seats of the event. Also, you can send PDF tickets to the customers that can contain barcodes. 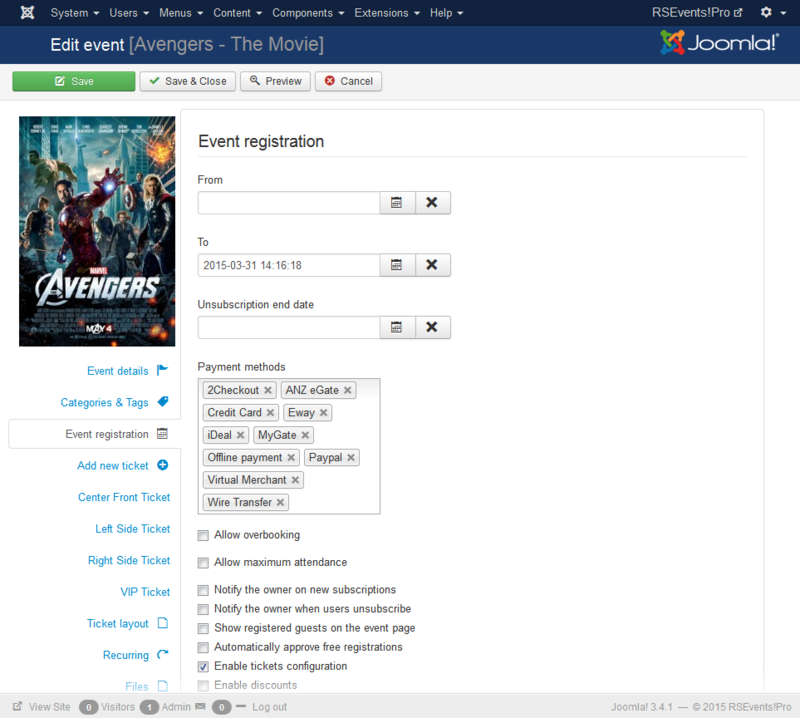 The registration has all the features you need to perfectly manage an event booking, by letting you set up overbooking rules and maximum attendance. You can also send notifications to subscribers and choose to publish the subscribers on the event page. 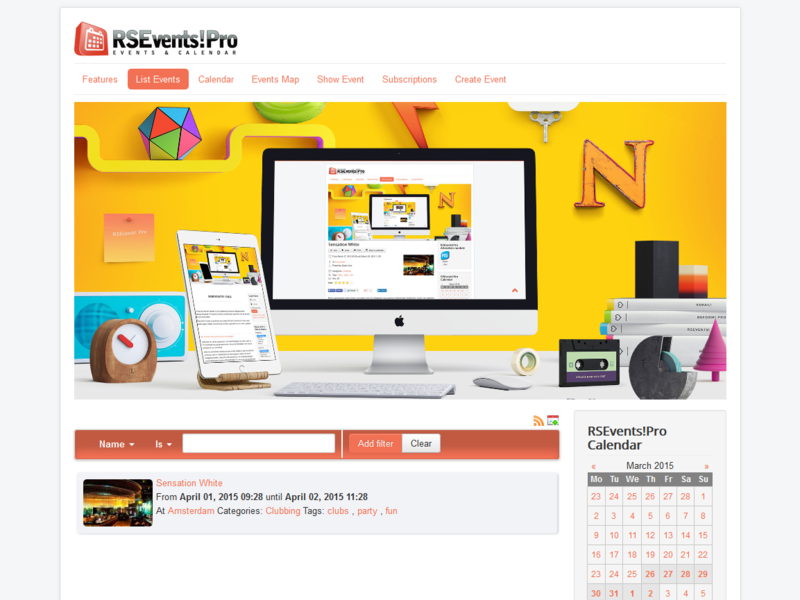 With RSEvents!Pro you can sell entrance tickets to your events and also set limitation and overbooking on the seats of the event. Also, you can send PDF tickets to the customers that can contain barcodes. You can divide the places into unlimited types of accommodation, each with it's own number of seats, price and description. RSEvents! Pro lets you track your subscribers and shows all the information you need related to a subscription. 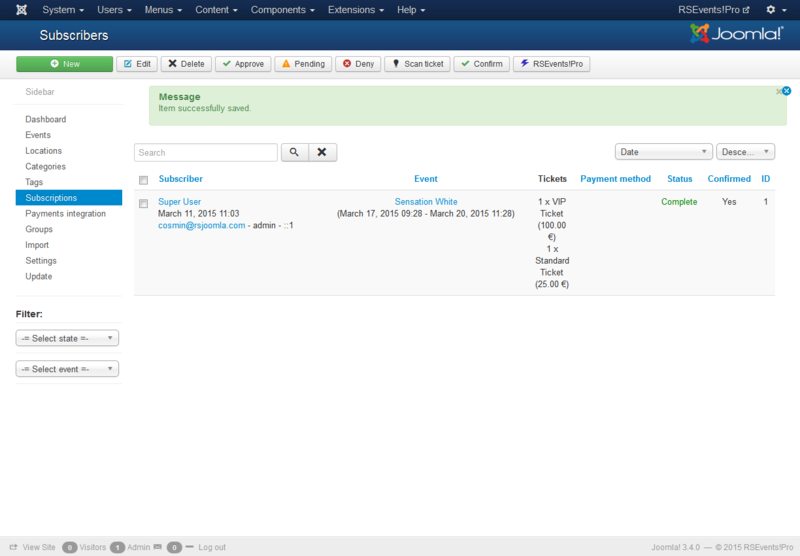 Subscribers can be filtered based on the event, the ticket of that event and the status of their payment. 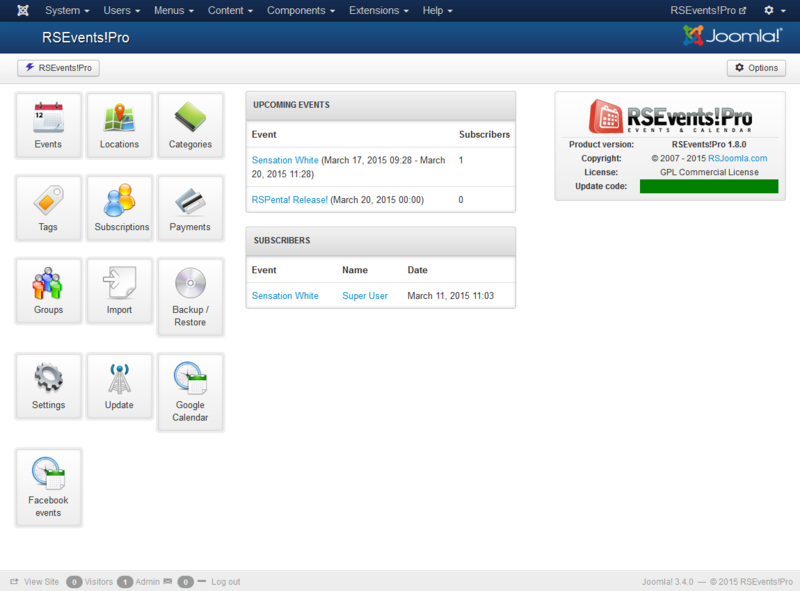 RSEvents!Pro lets you track your subscribers and shows all the information you need related to a subscription. Subscribers can be filtered based on the event, the ticket of that event and the status of their payment. 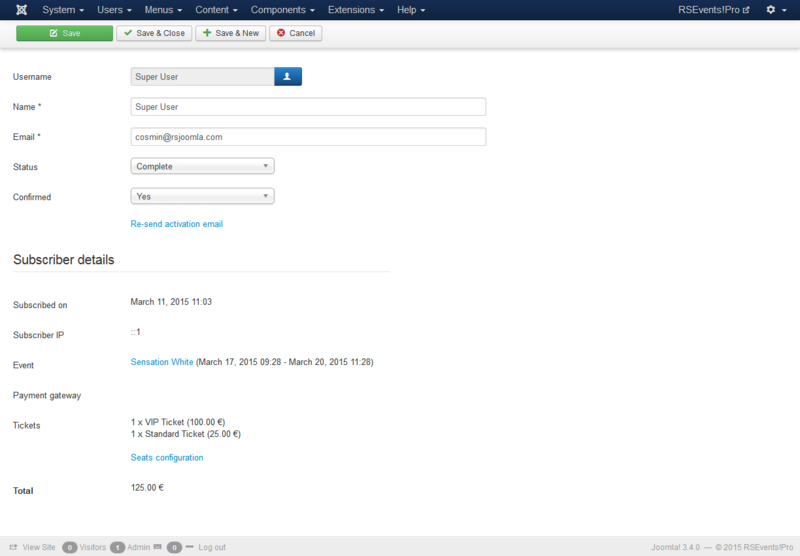 You can re-send activation e-mails and change e-mails, names and status of each subscription. RSEvents! 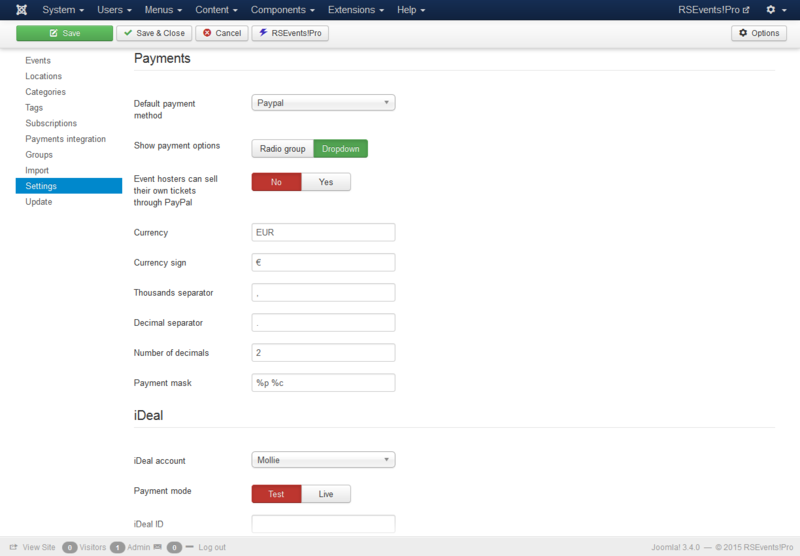 Pro has a series of payment plugins that can be installed to allow customers to pay with different methods. They can pay using Paypal, 2CheckOut, Authorize.net, IDEAL, Eway, Virtual Merchant, MyGate, ANZ Egate and Wire transfer. RSEvents!Pro has a series of payment plugins that can be installed to allow customers to pay with different methods. They can pay using Paypal, 2CheckOut, Authorize.net, IDEAL, Eway, Virtual Merchant, MyGate, ANZ Egate or offline payment. The back-end event listing has been improved in order to let you see all the details that you need. First of all, events that are ongoing will show up first in the list so you can change them on the run. Another group of events are the ones that will happen later this week, then later this month, next month and other upcoming events. The event listing can be quickly filtered combining more filters. 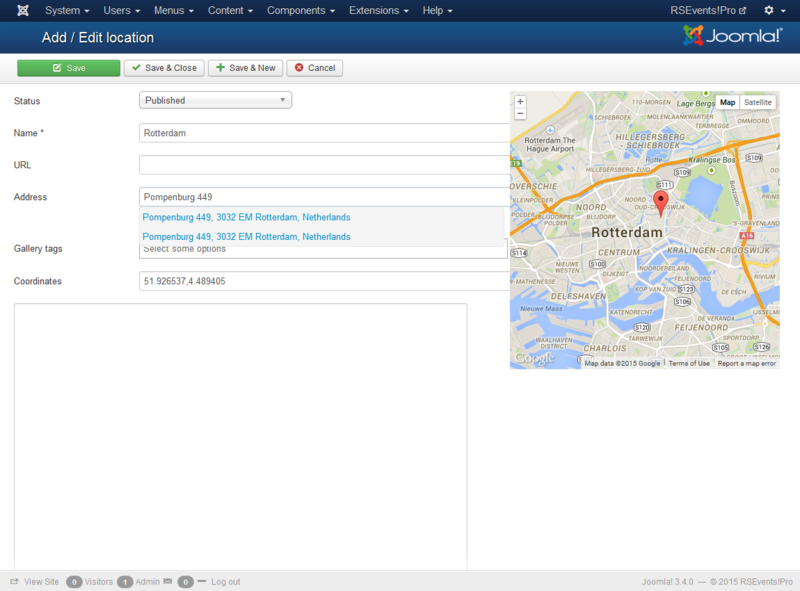 This way you could filter events happening at a specific location, that are listed in a specific category and so on. RSEvents! Pro shows the events according to http://www.schema.org/ that is officialy supported by Google, Bing and Yahoo. This way search engines will understand when the event will take place, where and what images and descriptions are related to the event. The semantic web will make your events and locations rank much higher in search engines. RSEvents!Pro shows the events according to http://www.schema.org/ that is officialy supported by Google, Bing and Yahoo. This way search engines will understand when the event will take place, where and what images and descriptions are related to the event. The semantic web will make your events and locations rank much higher in search engines. Of course, you're able to change meta description, keywords and title for each of your events on the run. We have improved the event page SEO by using heading tags. You can set up page title and description on the run to get a better listing. You are able to change the meta-data according to your needs. 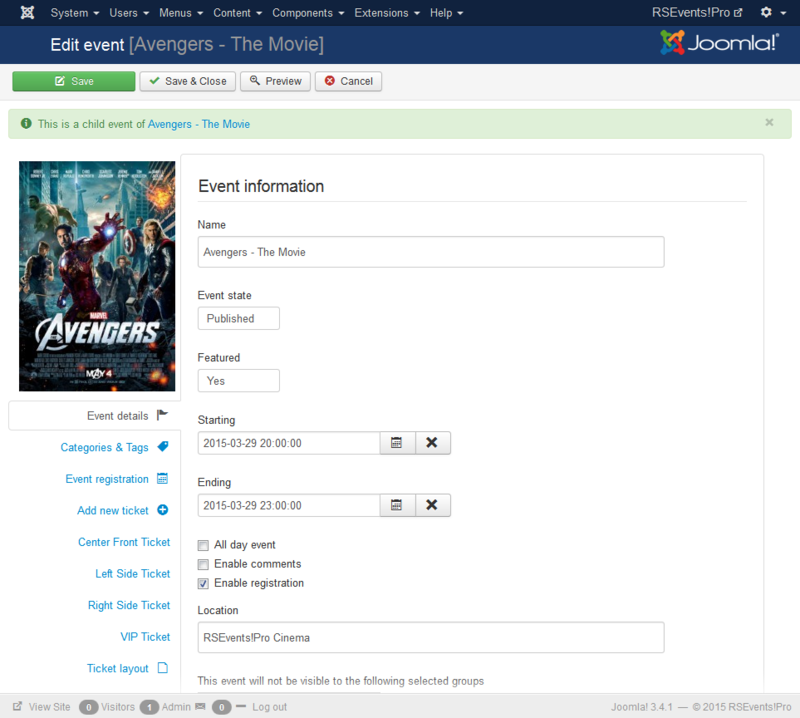 You can quickly choose what exactly to show when displaying the event to the users. In a bunch of clicks, you can hide end date, description, files or whatever you wish without changing a line of code. For those of you who wish to change the HTML of the layout, we know you'll be happy to hear that RSEvents! Pro now allows template overwriting. We have created an article that explains how to create a template override for your template. 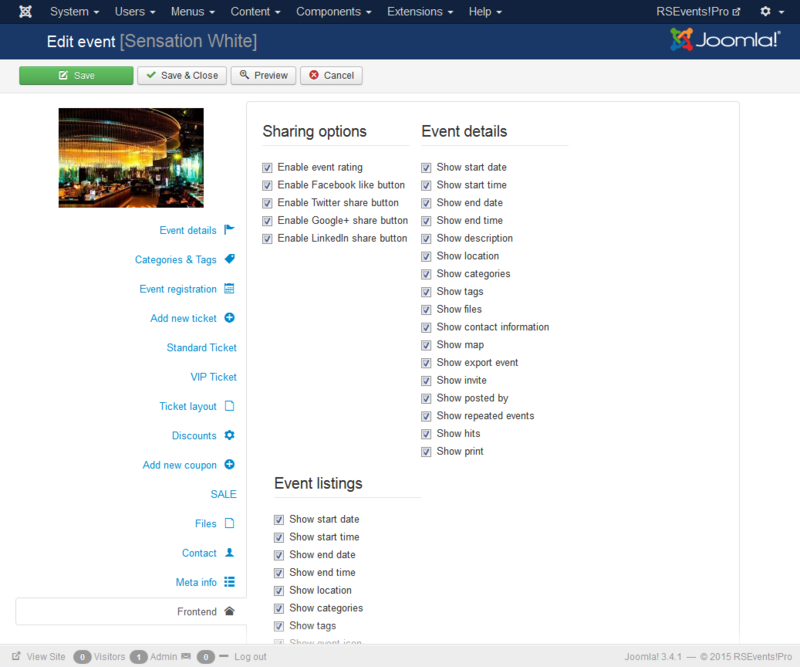 Your users will be able to search through events using the smart filtering options. They can combine multiple filters to refine their search with the intuitive filter dropdowns. When creating a menu item that lists events, you can combine multiple parameters, such as tags, categories, locations and so on in order to show up exactly what you want, when you want it. When editing the location address, Google will automatically suggest locations while you're typing. Also, you can get the address directly by moving the pin on the Google map. 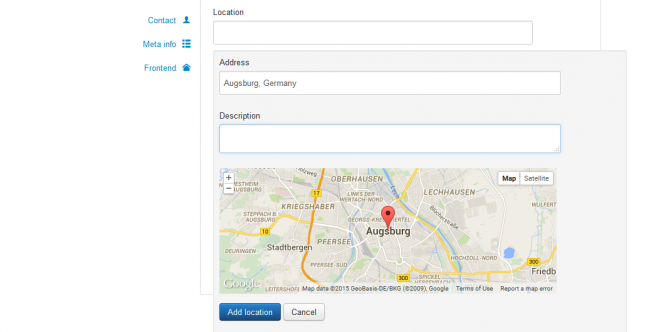 You can add the location URL and the description that will show up for the visitors. It often happens that you forget to first add the location and then create the event, so we overcame this by letting you to create locations while creating the event. Locations will show up while you're typing the name in the event location field and if no match is found, the add location window will show up. It often happens that you forget to first add the location and then create the event, so we overcomed this by letting you to create locations while creating the event. Locations will show up while you're typing the name in the event location field and if no match is found, the add location window will show up. 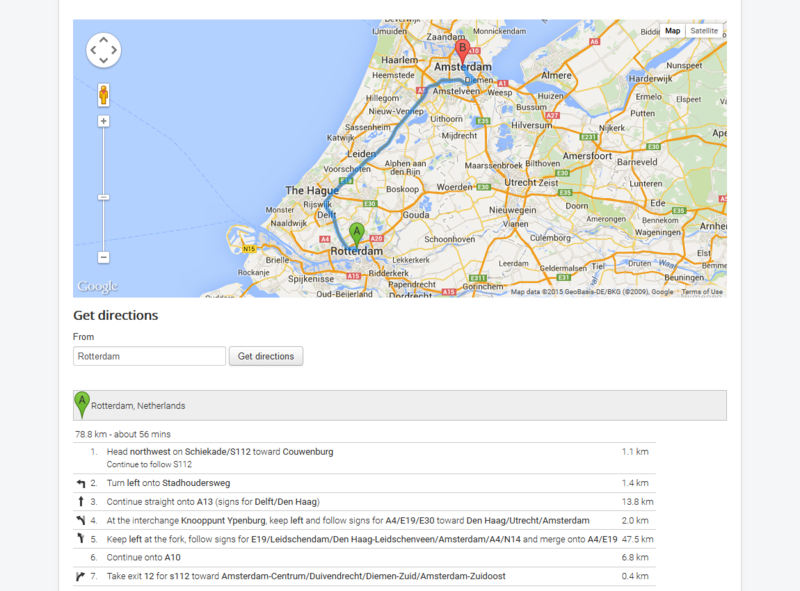 Users that look at your location can get directions from their address to the event directly with a click.